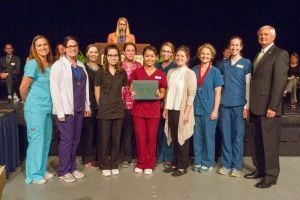 Pensacola State College presented 130 Student Excellence Awards at the annual Honors Day ceremony recently. Recognition included 67 Scholastic Achievement Awards, 19 Program Scholars, nine Department Scholars, seven Leadership Awards, five All-Florida Academic Team Awards, seven U.S. President’s Volunteer Service Award, 11 Service Awards, three Volunteer Service Group Awards, and two Sharlene E. Burkhardt Awards. PSC President Edward Meadows welcomed everyone to the awards celebration and Board of Trustees member Kevin Lacz who is a former U.S. Navy SEAL was the guest speaker. Michael Bailey, instructor for History, Languages and Social Science, chaired the Student Excellence Awards Committee, and Sara Wilson, director of Student Affairs on the Milton campus, was master of ceremonies for the event. All-Florida Academic Team Award recipients: Shaina Busby, Katherine Casperson, Kristina Jacques, James Rutger, Terri Vanderberg. Sharlene E. Burkhardt Award recipients: Michael Arabian, Jazmine Crane. U.S. President’s Volunteer Service Award recipients: Kimberly Arabian, Michael Arabian, Toby Castner, Angel Doyle, James Harris Jr., Kameron Nelson, Michael Shannon. Volunteer Service Group Award recipients: Outdoor Club at Milton campus; Student American Dental Hygienist Association at Warrington campus; Phi Theta Kappa-Theta Chi Chapter at Pensacola campus. Service Award recipients: Samantha Lorant and Carlos Smith from Milton campus; Rhonda Barfield, Sandra Ellison, Benjamin Holsworth, Ashley Lail, Sara Robertson and Kristin Tourney from Warrington campus; Hanna Fuller, Kelli Green and Karina Mendez-Rostro from Pensacola campus. Leadership Award recipients: Kaleal Church from Milton campus; Molly Blake, Jazmine Crane and Stephanie Cyr from Warrington campus; Rebecca Carlson, Jennifer Cumbie and Christopher Puglisi from Pensacola campus. Department Scholars: Alexis Tellis, Biological Sciences; Olyvia Woods, Collegiate High School; Lila Fitzpatrick, English and Communications; Carley Lambert, Performing Arts; Ryan Thronton, Physical Science; Renee Bates, Visual Arts; Matthew Seaton, Brice Threatt and Sadan Yagci in History, Languages and Social Science. Program Scholars: Brian Nielsen, Applied Welding Technology; Arlene Bronola, Business; Nadezda Kuznetsova-Hussey, Business Administration; Michael Owens Jr., Information Technology Security; Wendy Stubblefield, Crime Scene Technician; Kaitlyn Pace, Criminal Justice; Angel Zandikarimi, Dental Hygiene; Joannie Broussard, Early Childhood Education; Angel Doyle, Education; Christina Stults, Health Information Coder and Billing; Gerlinder Smith, Health Information Technology; Erick J. Austin, Heating, Ventilation and Air Conditioning; Micaela Cooley, Human Performance and Recreation; Steven Smith, Paralegal; Terry Jamison, Physical Therapist Assistant; Meghan Swann, Radiography; Sandra Ellison, Registered Nurse. Bachelor of Applied Science Program Scholars: Valerie Rocha, Health Care Management; Corry Baggett, Organizational Administration. Scholastic Achievement Award recipients: Daniel Anderson, Germon Anderson, Andrew Atkins, Jennifer Bailey, Kimberly Bogers, Carley Brink, Alexes Boutin, Christopher Brewer, Sandra Campbell, Rebecca Carlson; Helena Chappo, Daniel Colbath, Katelyn Clairain, Kendal Cobb, Kelly Coberly, Savannah Cowen, Mary Crazythunder, William Crutchfield, Christopher Felton, Alyson Francis, Erica Green, Katherine Greene, Gabrielle Guice, Colleen Hebert, Caymond Hodge, Sen Huynh, Gary Jacobs Jr., Terry Jamison, Siera Kautz, Meaga Kent, Amberly Kladitis, Shayden Lane, Destiny Lawrence, Zachery Macintyre, George Mansaray, Shelbey McCain, Sean Minton, Nicole Morse, Nhi Hoang Y Nguyen, Kenneth Oleson, Lori Perko, Tracy Pham, Vincent Potate, Michael Ramos, Karissa Rauch, Shelby Roberts, Pamela Sandoval, Luke Sekula, Lily Sigei, Maryrena St. Clair, Tristan Stabler, Arianna Stokes, Breann Talbert, Andrew Thompson, Ryan Thornton, Robert Towson, Allison Von Brock, Margaret Walker, Karlyn Waters, Felecia Wiggins, Craig Wyse, Sadan Yagci. Bachelor of Applied Science Scholastic Achievement Award recipients: Jeff Mannion, Amber Silcox, Christin McCallister, Shelby Williams. Bachelor of Science in Nursing Scholastic Achievement Award recipient: Rebecca Ricks.